Communal living is an important aspect of the residential college experience. A useful education includes the life skills around communication, living with others and resolving conflict—all common pieces of the residential experience for students. Residence Life & Housing supports the advancement of the academic mission of the college through the residential model. Our philosophy of residential living is grounded in the history of Dickinson. 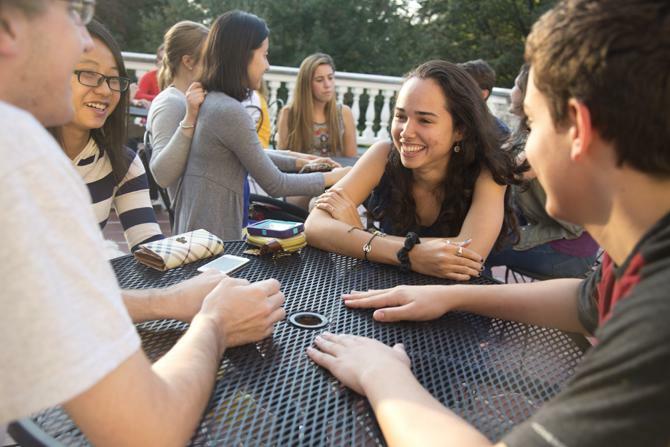 As a residential college, Dickinson has a four-year residency requirement, meaning that all full-time enrolled first-year, sophomore, junior and senior students are required to live in college housing and participate in a college meal plan. As an integral part of the out-of-classroom experience, students living in college residences will increase their cognitive, interpersonal and intrapersonal development and complexity. Students need space for physical and intellectual activities to fully benefit from this experience. We work with students to meet their needs on campus by creating the environment in college residences that will be most conducive to their overall success, both academically and socially. As a residential college, Dickinson models sustainable living practices in all residential spaces. In 2018, The Center for Sustainability Education and Residence Life & Housing created a Sustainable Living Commitment. For more information, please visit the sustainable living website. First-year students are assigned to live in one of two areas on campus: "Morgan Field" which includes Adams or Drayer or "The Quads" including Armstrong, Atwater, Baird-McClintock, Buchanan, Conway, Cooper, Davidson-Wilson or Longsdorff. As a member of the first-year community, students will have the opportunity to participate in social activities and community service with a local community partner, attend a faculty dinner, and serve in a leadership role through involvement in the Community Board. Each upperclass area has either a resident advisor (in the residence halls) or a house & apartment manager, who is a student who works to develop a sense of community within each area. Upperclass students have the same opportunities to participate in social activities, attend faculty dinners and serve in leadership roles through involvement in a Community Board.